THE TRUE STORY OF 'JUST SAY GNOME!' - Just Say Gnome! Back around 2004 I (Just Say Gnome! 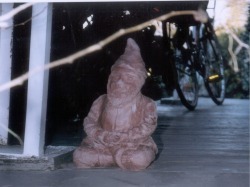 sculptor Steve Herrington) and some friends were standing around talking in the kitchen of our home in SE Portland, - and someone mentioned linguistics professor and activist NoamChomsky, and a few minutes later someone else brought up garden gnomes. Then suddenly several of us said, “Ah! 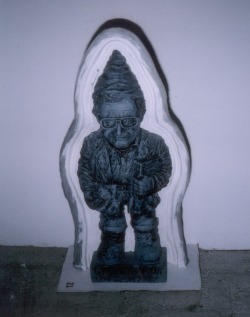 Garden Gnome Chomsky!” After searching over the Internet a little I soon realized that the Gnome Chomsky idea had been around for awhile – but despite a few cartoons of the concept no one seemed to have actually made a real Gnome Chomsky – not as a real gnome sculpture anyway. 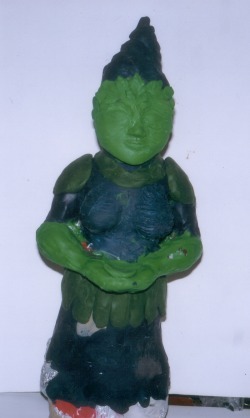 So after thinking about it for a couple years or so (I’m kinda slow) I (Steve) decided to try making a real Garden Noam sculpture – and thus a new gnome revolution began! Gnome Molds in Development. Yes, I can be a slob sometimes. Well it wasn’t exactly that dramatic. 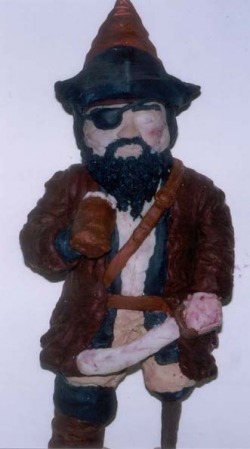 It took a while to get the first gnome sculpted – using Sculptey™ oven bake clay. I badly burned the nearly-completed first attempt and had to start over - at least once. And then the challenges of mold-making were even more frustrating. I talked a little to local sculptors about what molding material I should use – latex or silicone, RTV or catalyzing, etc. Some materials I tried fell apart, or took too long to ‘cure’, or stuck to themselves. And the worst was just too toxic: even though I tried to protect myself from the fumes with a good respirator mask I didn’t have the mask sealed properly and inhaled enough fumes that I couldn’t really think right for a couple days. Eventually a combination of a two-part silicone rubber formula and regular silicone caulking (usually used for sealing bathrooms and kitchens) was settled on and worked okay. At first I tried casting the gnomes in a plaster material –but soon realized that cement was the way to go for outdoor durability. – but there’s more information about the whole casting process [ here ]. 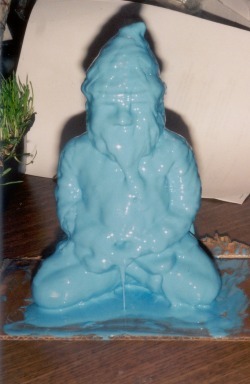 OM Gnome with layer of silicon mold rubber - I'm Melting! Some of these gnome ideas are in development – and some may never be – and many of the earliest ideas still haven’t made it into a physical 3-D gnome form yet. Now that the business is getting a bit more Sirius and national – we’ll just have to see what happens. Whatever gnomes get made – or at least get illustrated I hope that you like them – or at least that they make you laugh a little. GNOMES TAKING OVER THE FLOOR! Just Say Gnome! gnome production started off in a small laundry / tool room in the basement of my former residence – where housemates kindly didn’t complain much at all though they often had to maneuver around several little pointy-hatted dudes just to clean their clothes. But now gnome production has moved to a much more comfortable ‘birthing room’ occupying half of a whole 2-car garage – which admittedly still isn’t a lot of space – but it works for now – and the gnomes seem happy enough. And the plan is to put up some movie posters soon –and maybe add some ceramic squirrels and other creatures and fake plants to the room too – to make it seem like a more natural habitat for the gnomes to be born into. As of this writing the gnome shipping department is still in development but should be up and running soon. 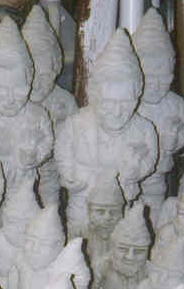 Right now two-part silicon molds are being used to cast gnomes in cement but other methods and materials are being researched for future gnome development and production. From Laundry-Basket Marketing to InterGnational Empire! Curiously, back in the ‘early days’ when Just Say Gnome! gnomes were still being made in a laundry room the best available container for carrying and displaying them to local stores was – appropriately enough – a laundry basket. Hawthorne street in Southeast Portland – near the sculptor’s home at the time – was the natural first area to try to market the gnomes. So peeking out of this laundry basket the early gnomes were introduced to the World - from head shops and gothic fashion stores – to international import stores, metaphysical-new age shops, and Powell’s Home and Garden store. Overall it was really surprising how receptive many stores were to the gnomes - some stores even bought gnomes that day. 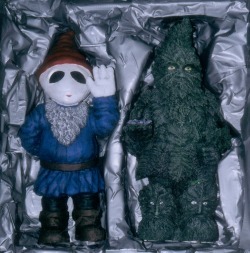 Later attempts at local gnome sales often didn’t go very well at all, but over time it became clear that many people liked these new varieties of gnomes and that there really could be a national market for them. - Story to be continued .... ! stayed tuned.